Although it’s spring here in the DC area, we are still experiencing (more) than our fair share of cool nights. Which calls, in our house, for a bold red wine. 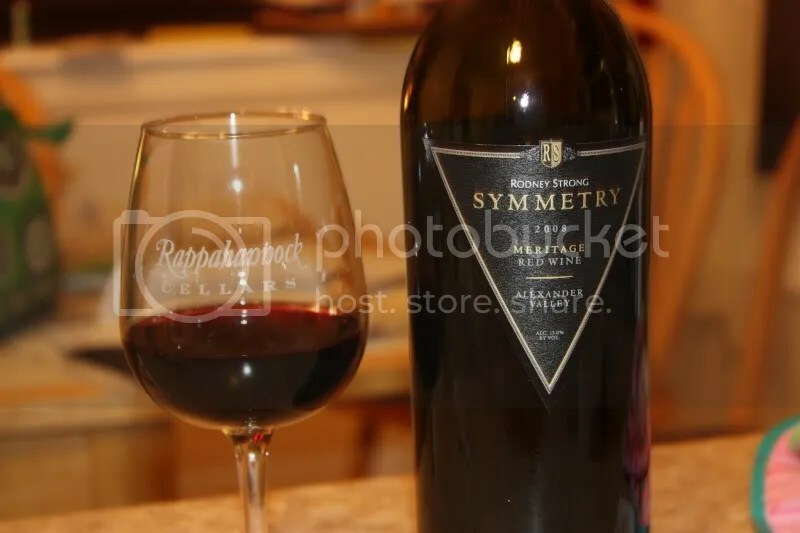 What fit the bill tonight was the 2008 Rodney Strong Symmetry, a Mertiage blend from Sonoma. The wine has a real cork closure, clocks in at 15% alcohol by volume, and retails for around $40. 1.) This Meritage blend really showed the influences of the Cabernet Franc and the Petit Verdot in the blend. 2.) The Symmetry had the the kind of nose that made me want to dive in and swim in my glass. 3.) I served this with steak. It was a good choice. 4.) At $40ish I think this offers a great value for this type of blend from Sonoma. On the nose I got spice, earth, black plum, sage, mint, cedar chest and chocolate notes. The herbs on the nose got me excited for my summer herb garden. In the mouth I found spice, licorice, earth, black plum, black berry, black cherry, and more spice. In fact, I wrote “spicy, spicy, and spicy” as the last three words in my notes.